Zulfi Hoxha is an American senior commander in ISIS. 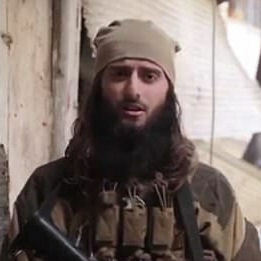 He has also appeared in at least one propaganda video for the group. Before joining ISIS, Hoxha communicated with other American ISIS supporters on social media, who helped fund his travel to Syria. He departed for Syria in April 2015 and became a foreign fighter for ISIS.Seamus Hughes et al., “A New American Leader Rises in ISIS,” Atlantic, January 13, 2018, https://www.theatlantic.com/international/archive/2018/01/isis-america-hoxha/550508/. Hoxha was born in the United States to Albanian parents. He grew up in Margate, New Jersey, and graduated from Atlantic City High School in 2010.Craig R. McCoy et al., “From Atlantic City High to ISIS: the path of a homegrown terrorist,” Philadelphia Inquirer, January 19, 2018, http://www.philly.com/philly/news/nation_world/american-isis-commander-atlantic-city-margate-zulfi-hoxha-2-20180119.html. According to his mother, he attended a mosque, where he may have been radicalized.Ariel Zilber, “‘Liberate yourself from hellfire by killing a non-believer’: Terrorist seen executing a prisoner in vile ISIS propaganda video and urging lone wolf attacks in the US is a New Jersey high school graduate,” Daily Mail (London), January 19, 2018, http://www.dailymail.co.uk/news/article-5290151/ISIS-soldier-seen-beheading-video-American.html. Hoxha was active on social media before his departure for Syria. He reportedly operated a Twitter account on which he interacted with other ISIS supporters as well as the U.S. State Department’s “Think Again Turn Away” counter-propaganda account in October 2014. He was also active on the video gaming website Steam, where he reportedly first interacted with David Daoud Wright, a U.S.-born ISIS supporter who plotted to carry out a domestic terror attack, sometime before November 2014. Hoxha and Wright discussed their support for ISIS on Skype and the messaging app Paltalk, where they participated in pro-ISIS chatrooms and shared ISIS propaganda materials with each other, including execution videos and the magazine Dabiq. Wright and his uncle Usaamah Abdullah Rahim––who was later shot and killed by law enforcement officers after he tried to attack them with a large knife––sold a laptop on Craigslist to help Hoxha raise money for the plane ticket that he would use to travel overseas to join ISIS.Seamus Hughes et al., “A New American Leader Rises in ISIS,” Atlantic, January 13, 2018, https://www.theatlantic.com/international/archive/2018/01/isis-america-hoxha/550508/. Hoxha departed the United States for Istanbul, Turkey, on April 6, 2015. By April 10, he had arrived at an ISIS training camp in Syria. Hoxha informed Rahim of his arrival in ISIS territory through an encrypted messaging app. After Hoxha began training, Rahim continued to receive updates on his activities from British ISIS facilitator Junaid Hussain.Seamus Hughes et al., “A New American Leader Rises in ISIS,” Atlantic, January 13, 2018, https://www.theatlantic.com/international/archive/2018/01/isis-america-hoxha/550508/. According to U.S. law enforcement, Hoxha was a senior ISIS commander as of 2017.Seamus Hughes et al., “A New American Leader Rises in ISIS,” Atlantic, January 13, 2018, https://www.theatlantic.com/international/archive/2018/01/isis-america-hoxha/550508/. Hoxha has also represented ISIS in the group’s propaganda videos. In May 2017, Hoxha appeared in an ISIS propaganda video filmed in northwestern Iraq entitled “We Will Surely Guide Them To Our Ways.” In the video, masked and using the name “Abu Hamza al-Amriki,” Hoxha calls upon supporters to carry out domestic terror attacks within the United States. Hoxha’s identity in the video was confirmed by the the U.S. government.Seamus Hughes et al., “A New American Leader Rises in ISIS,” Atlantic, January 13, 2018, https://www.theatlantic.com/international/archive/2018/01/isis-america-hoxha/550508/. Another ISIS propaganda video released in October 2015 shows an American ISIS fighter beheading a Kurdish soldier. According to the Atlantic, the American speaks with “the same accent and inflection as Hoxha in the May 2017 release.”Seamus Hughes et al., “A New American Leader Rises in ISIS,” Atlantic, January 13, 2018, https://www.theatlantic.com/international/archive/2018/01/isis-america-hoxha/550508/. Abu Hamza al-AmrikiSeamus Hughes et al., “A New American Leader Rises in ISIS,” Atlantic, January 13, 2018, https://www.theatlantic.com/international/archive/2018/01/isis-america-hoxha/550508/. Zulfi Hoxha is an American senior commander in ISIS. “America today is the one carrying the banner of the cross and waging war against the Muslims…It openly declares that its goal is only to wipe out the Islamic State. May they fail and lose.”Craig R. McCoy et al., “From Atlantic City High to ISIS: the path of a homegrown terrorist,” Philadelphia Inquirer, January 19, 2018, http://www.philly.com/philly/news/nation_world/american-isis-commander-atlantic-city-margate-zulfi-hoxha-2-20180119.html. “Are you incapable of stabbing a kaffir [non-Muslim] with a knife, throwing him off of a building, or running him over with a car? Liberate yourself from hellfire by killing a kaffir.” Craig R. McCoy et al., “From Atlantic City High to ISIS: the path of a homegrown terrorist,” Philadelphia Inquirer, January 19, 2018, http://www.philly.com/philly/news/nation_world/american-isis-commander-atlantic-city-margate-zulfi-hoxha-2-20180119.html.